Screaming out loudly with my heart (Dil se) “Jayaho Rehman” …That’s how I can convey my Congrats to my pacifier. It is the proudest moment for Indians like me. It’s not only my acclaim but also the entire globes. 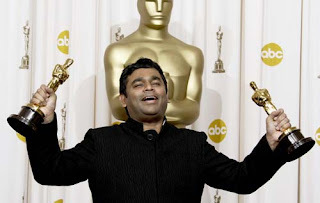 A R Rehman(Allah Rakkha Rahman) proved again the best musician in the world; holding two Oscars in his hands in the 81 Acadamy Oscar Awards function for categories Best Original score and Best Original song. He is the Music Magician. What not; as a whole he is the glory to My India. He is humble in his thanks speech even,How great? And sensible he is! “God is great” he said this in his regional language Tamil. It reveals and reminds us the perfection of our life and dedication in work. "All my life I had a choice between hate and love. I chose love and I am here," said Rahman after receiving his second golden statuette. There may be 1000 critics to talk about “Slumdog Millionaire”, but I strongly feel it unveiled many true facts about India, What’s wrong in that? We are like that hence we are...I am strong enough to accept the true fact. Why should we hide ourselves? Keeping all these discussions aside A British director - Danny Boyle’s Vision about India in the form of “Slumdog Millionaire” won the 8 Oscars out of 10 nominations in best categories including Best Picture, Best Direction, Best Adapted Screenplay, Best Cinematography, Best Sound Mixing, Best Film Editing, Best Original Score and Best Original Song. When A R Rehman got Golden globe award for his “Jayho” song from this movie and when I came to know that he was nominated for 3 Oscars for this film I strongly decided that; he will definitely get at least one. But I am pretty sure; all this happened only due to a British Director for this film. If it would have been directed by other than British man; keeping the technical crew for the film as same as now I don’t think it would have happened. But what ever the reason our talent got reputation globally. 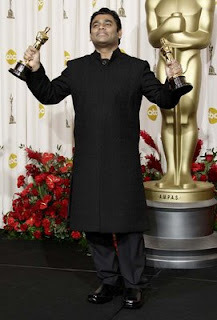 Rehman is the first man who received 2 Oscars in a same Acadamy awards function. This is enough! He proved it. He conveyed this message in one interview. I felt those are really pleasing and inspiring. “Be open and Do some thing Original” – this is the best message to young talents. According to me Rehman has given so many better scores in many Indian films prior to Jayho; but he got no reputation for any .But this time every thing is only due to British director. Rehman has spelled his music combining Kawaali and sufi tunes.Every body are pleased with his rocking scores. The Indian music maestro, AR Rahman wooed the audience while performing ‘Jai Ho’ on stage as a nominee for Best Original Song. From bottom of my heart this is my hearty congratulations to Rehman and this post is dedicated to you. 2 comments to "Dil se - Jayaho Rehman"
One more reason is that its produced by Warner Bros, who can who can change the face of Oscars! We can say its just a trick to grab the attention of Indian film industry, one of the big film industies in the world, just like one cosmetic gaint released their product in the name of Aish to enter into Indian market!! Finally, I must say, movie is worth getting Oscars which got typical features of Oscars and music is outstanding, one can definitely feel while sitting in front of the silver-screen.